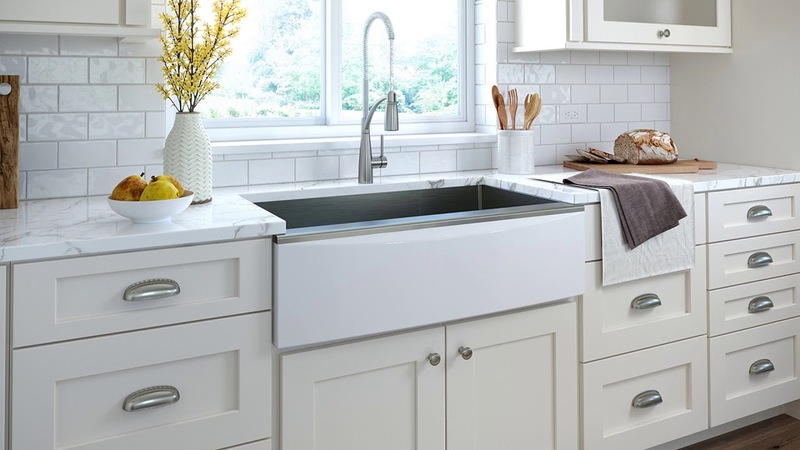 Are you thinking about shifting to a farmhouse sink or just replacing your old one? 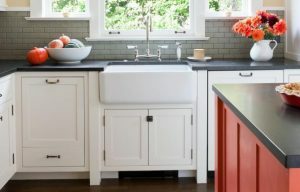 For those who are new to this, a traditional farmhouse sink is typically deeper compared with the modern sinks today. Whether it’s an under mount or top mount, its design allows you to have direct contact with the basin. This is what we mean when we say that you can stand directly in front of your sink’s front side. No cabinets or countertops in between, just you and your sink. So when it comes to functionality, this sink proves to be versatile. Back then, women used to give their babies a bath on this type of sink. When they’re not using it to prepare food or wash the dishes, they also use it to wash their clothes. Regardless of how you want to use yours, you can farmhouse sinks are made from different materials. It can also have different designs that can fit your needs. Now, be sure to stick with us if you really want to get the best farmhouse sink on the market today. This Editor’s Choice from Kraus is a great option for heavy-duty use. It’s made from stainless steel and other materials that make it dent and wear-resistant. It’s hassle-free to clean though require high maintenance to keep it shiny. It’s also constructed with soundproofing technology to prevent making noises when something hits it including the running water. It also comes with free accessories like a protective bottom grid, Kraus kitchen towel, and a set of premium 3-piece basket strainer. 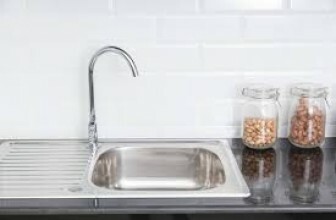 For those who are looking for an affordable farmhouse sink, this is the model we sincerely recommend. As our Editor’s Choice, it’s built to be indestructible and quiet when washing the dishes and using the garbage disposal. It’s basically a smart combination of function and style without escalating its price. 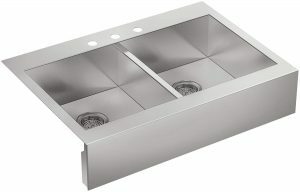 Another impressive farmhouse sink that is design and manufactured by Kraus, you can get this Budget Pick at only $400. It’s a statement piece that is simply hard to ignore with its shiny stainless steel. It has a satin finish and soundproofing technology that eliminates noise when something knocks on it. It’s also easy to clean to maintain its modern look with its stylish but functional design. Aside from offering a durable construction, it also comes with free accessories. 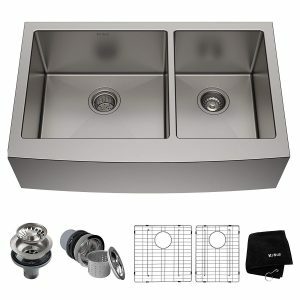 Thus, it has 2 protective bottom grids, Kraus kitchen towel, drain assembly with strainer, and a 3-piece set of premium basket strainer. When your budget is a hindrance when it comes to shopping the best items, review guides like ours are really handy. Ideal for budget-seekers, our Budget Pick model is indeed one of the most affordable options. Without sacrificing its quality, this model proves to be indestructible. This Whitehaven farmhouse sink with an apron front comes with self-trimming edges. These edges only require a rough cut to the cabinetry during the installation. 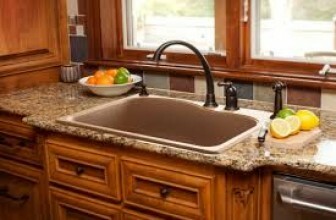 Its short apron front makes it a great replacement sink even without changing your current cabinets. It provides plenty of workspaces and low barrier that come in handy when soaking your oversize cookware. Most importantly, it’s made from Kohler’s enameled cast iron that doesn’t chip, burn, or crack which extends its lifespan. 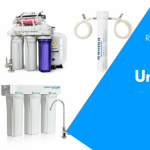 For those who are looking for the best sink replacement without changing their current cabinets, this is it. 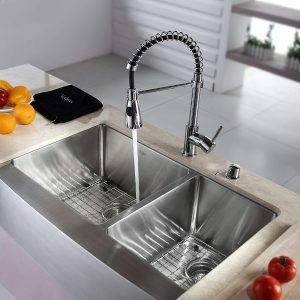 It’s not that deep compared with the typical farmhouse sink but it’s very spacious and stylish. It’s also resistant from being burned, cracked, and chipped which we find really appealing. 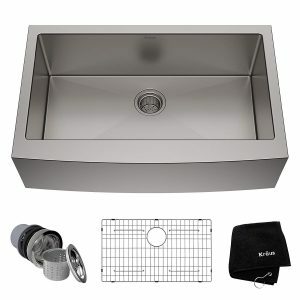 If you want a complete set of stainless steel farmhouse sink, faucet, and soap dispenser check this out. This package offers a complete set that can help you save time when shopping. At the same time, you can guarantee that each item is made from high-quality materials. Thus, it’s very cost-efficient and practical for budget-seekers. 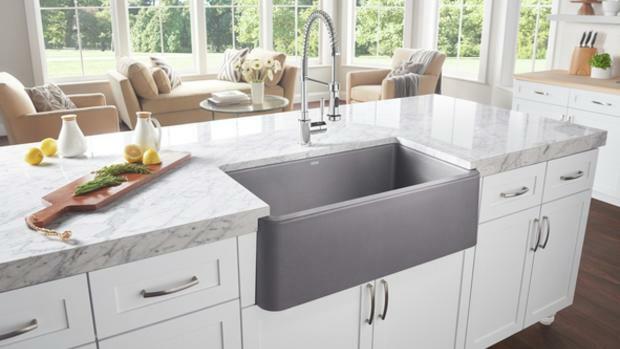 With clean lines that are combined with the traditional farmhouse style, this Kohler sink integrates both seamlessly. Its apron front style works with a wide range of kitchen spaces which proves its versatility. This handcrafted double-bowl sink is made from high-grade stainless steel to maximize its long lifespan. Since it has a top mount design, it’s faster to install on standard laminate countertops. Most importantly, it already has 3 faucet holes for hassle-free faucet installation. If you’re looking for a farmhouse sink that can complete your kitchen’s log cabin concept, this model might work. Due to its copper’s natural color, it can blend in easily with the wooden accent. At the same time, its handcrafted end result makes it more appealing and unique. Most importantly, its solid copper with the finest quality guarantees its ability to last a lifetime. 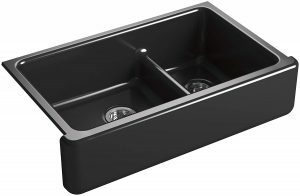 How to Choose the Best Farmhouse Sink? The side of your farmhouse sink can affect the size of your countertop and cabinet where it should be installed. Some people may take a while when considering the size of the sink they want when undergoing a kitchen remodeling. Should you get a 30 inches sink or something bigger if you have enough space? Basically, 30 inches is already large enough but there’s nothing wrong with opting for a bigger if space permits. Getting a bigger size will help you fit in more dishes. A bigger sink also comes in handy when cleaning bigger pots and pans or filling them with water. This way, you can get on with your tasks with enough workspace. However, the size of your sink still depends whether you want a kitchen renovation or simply a sink replacement. If you’re planning for a replacement only, you have to base your sink’s size on your existing counter and cabinet. But if you want a renovation, you can be more flexible when it comes to selecting a size. Consider your cabinet’s size below. 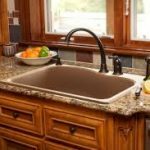 One of the most popular characteristics of a farmhouse sink is its deep basin. It’s one of the main reasons why customers opt for this kind of sink. However, its depth can also affect the size of your cabinet underneath it. The deeper your sink is, the smaller your cabinet can get since it will eat a lot of space. In this case, the depth of your sink will depend on your cabinet if simply want a replacement. But if you need a renovation, you can decide on the cabinet size and countertop based on your chosen sink. Regardless, the cabinet where your sink will sit on top should be a few inches bigger and not smaller. Do you want a single or a double-bowl sink? The next thing to decide on is your sink’s number of basin. Since there’s no existing standard when it comes to this aspect, it’s all up to your personal preference. Farmhouse basins can have a single or double-basins. If you want separate basins: one to fill with soapy water then another to rinse your dishes, get a double-basin. But if you think that its size will be a problem when you soak your pan, get a single-basin. Whether you want a single or double-basin, make sure that it can give you enough space to accomplish its purpose. How do you want it to be installed? Most farmhouse sinks are installed as an under mount which can allow you to clean up your counter more efficiently. You can simply wipe up the counter’s mess right into your sink which makes the job faster. A top mount installation may work prevent some splash from messing your counter too much. 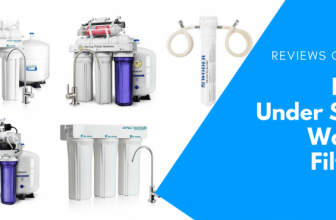 However, its jutted parts won’t allow you to wipe up your counter’s mess directly into the sink. Thus, cleaning your counter with a top mount farmhouse sink may take more time and effort. Anyway, this is simply based on our experience so the final decision is still up to you. Choose the kind of finish you prefer. Fireclay – from modern to traditional kitchen concepts, a fireclay finish can blend in smoothly. It’s also the most popular option on the market due to its timeless beauty. Typically, it’s available with the simple and flat front side but modern versions today include fluted aprons and raised front lips. Stainless – this normally gives a modern look to kitchens whether it has an exposed apron design or enclosed by its cabinet. Its most common designs include straight and defined lines that are perfect for any industrial setting and modern kitchen. 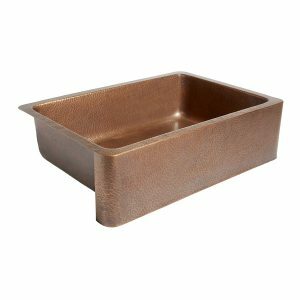 Copper – compared with the first two kinds, copper farmhouse sinks come with more intricate designs due to its natural flexibility. With natural metals, manufacturers offer this finish with either smooth or hammered but detailed designs. Its classic designs that can be seen on its apron front include wildflowers, basket weave motifs, and grape vines. How much does a farmhouse sink costs? Most farmhouse sinks are available for as low as $400 and could be as high as $1,000 or more. Some models could even cost $2,000 while others can be available in less than $400. Regardless, this price range just shows that investing in a farmhouse sink really needs serious decision making. 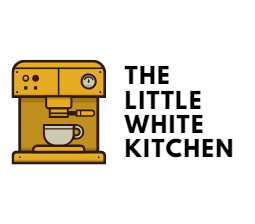 You may fall in love with its looks as the statement in your kitchen but it comes with a huge cost. Can it help prevent falls and breaks? Thanks to the popular design of farmhouse sinks, you can reduce the risk of breaking your precious collections. Its depth can help you avoid breakages and nasty cuts every time you accidentally drop your dishes. If you prefer a single-basin sink, you can use it like a double-basin sink by placing 2 containers inside. Thus, you can soak your dishes on soapy water then rinse them on the other container. Do you have to lean over while doing the dishes? Since farmhouse sinks typically have an apron design, you don’t need to lean over too much like on other sinks. It’s much closer so you can do the dishes easier as long as you know how to deal with sprays. In this case, be sure to wear a waterproof apron whenever you’re washing the dishes. The maintenance of your farmhouse sink depends on its finish. Fireclay finish requires less maintenance since it can resist scratches, stains, and harsh cleaners. Moreover, those food particles that can leave stains can be wiped away easily on fireclay sinks. When it comes to stainless steel sinks, you can clean it in a circular motion using mild abrasive cleaners. Never leave steel utensils on it for a long time and keep it dry to prevent stains and water spots. A farmhouse sink is no doubt one of the best types of sinks to invest on. It’s a kitchen statement that brings back the days when traditional farmhouse sinks were used even before faucets were invented. It’s very spacious that you can use it for more things aside from preparing foods and washing the dishes. You can use it to wash your clothes and to give your baby a refreshing bath. Thus, it’s really a versatile sink that is worth to invest on no matter how expensive it is. Just be sure to communicate it with your plumber and cabinet/countertop contractor to make sure that your sink fits perfectly.